Crealock's paintings were given to the Regimental Museum, where they are now housed. 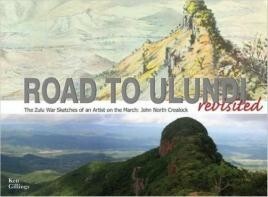 In 1964, a selection of the water colours was copied by the University of Natal Press and published in a book entitled The Road to Ulundi. The result is a truly unique item of militaria, which is likely to become a sought-after item of Africana. Unfortunately, due to sales rights restrictions, we cannot offer The Road to Ulundi Revisited for sale in your country. In Victorian times, it was to an officer’s advantage to be good at sketching. This subject was not only on the syllabus at Sandhurst but also at the Army Staff at Camberley until the Anglo-Boer War of 1899–1902, and later. The reason was the British Army seldom had properly surveyed maps of wherever it was fighting, and so an important part of the duties of a junior officer and of a trained staff officer in particular, was to be able to produce a good sketch map and panorama for his commanding officer. Lt-Col John North Crealock was a veteran of the Indian Mutiny and the younger brother of Major-General Henry Hope Crealock, who commanded the First Division during the second invasion of Zululand in May 1879. He had earlier served with Chelmsford at Aldershot and was appointed to what has been described as a “plum staff appointment” at the Horse Guards. Crealock became Chelmsford’s military secretary in the Anglo-Zulu War of 1879 and it is gererally accepted that all Chelmsford’s “disagreeable orders” supposedly emanated from him. He was described by Sir Garnet Wolseley (who replaced Sir Bartle Frere and Chelmsford) as “that arch-snob” and ‘evil genius”, accused of “governing Chelmsford and keeping him in ignorance of all going on about him”. Nonetheless, he was a skilled painter in watercolours. Crealock was slightly wounded at the Battle of Gingindlovu on the 2 April 1879 and, in July 1880, on his return to England, he was appointed commanding officer of the 95th Regiment of Foot, serving with them in Gibraltar in 1881, Egypt in the 1882 campaign, and then on to India. The regiment was linked with the 45th Regiment of Foot to be renamed the Sherwood Foresters in 1881. Crealock handed over command in July 1885. He is described in the regimental history as a “progressive and appreciative Commanding Officer”. On his return from India in 1890, Crealock was given command of 5th Brigade and promoted to major-general. He returned to India in 1893 and died at Rawalpindi on 26 April 1895. Crealock’s paintings were given to the Regimental Museum, where they are now housed. In 1964, a selection of the water colours was copied by the University of Natal Press and published in a book entitled The Road to Ulundi. South African historian Ken Gillings spent three years identifying and photographing the sites depicted in the book and was impressed by their accuracy. The trustees of the Museum of the Mercian Regiment (of which the Sherwood Foresters was an antecedent regiment) have kindly given the publishers the go-ahead to republish the sketches, with the accompanying photographs and explanatory notes prepared by Gillings. The result is a truly unique item of militaria, which is likely to become a sought-after item of Africana.